After one of the stormiest Decembers on record, with relentless wet and windy weather continuing into the New Year, flooding has returned to much of Southern England. The storms brought wind and rain to many parts of the United Kingdom with southern and western coasts most badly affected. 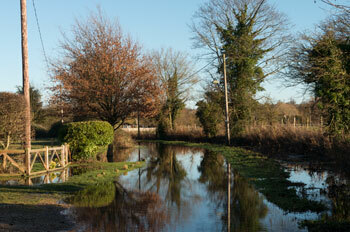 The most severe storm affecting Radley occurred on 23rd December continuing into the small hours of the 24th. 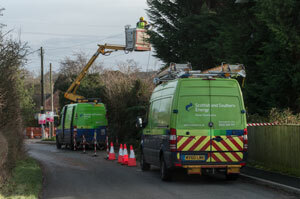 A falling tree brought down power lines in Lower Radley just after midnight on Christmas Eve causing disruption of power supplies to many houses in the village. Repairs were carried out later the same day enabling supplis to be restored in time for Christmas. Many people in other parts of the country were not so lucky. 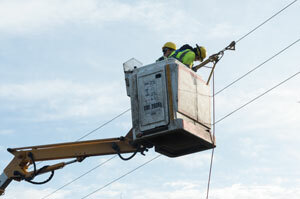 Repairing power lines in Lower Radley on Christmas Eve, after the storm the night before. The River Thames, whose catchment area covers large areas of southern and western England, where rainfall has been significant , reached record levels between Oxford and Abingdon on the afternoon and evening of Thursday 9th January. In Oxford. 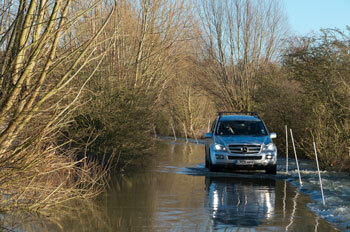 flooding once again has affected the Botley and Abingdon roads, which remain closed to traffic. 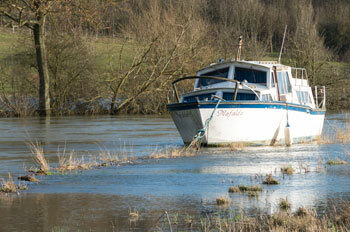 In Abingdon, the river level downstream of the lock, rose to 3.62m above the site datum (ASD), above its 2007 peak, and some flooding occurred along St Helens Wharf. 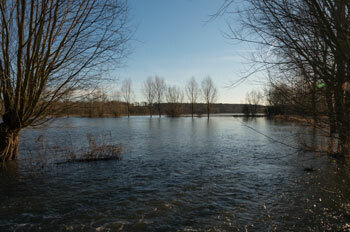 The upstream level reached 0.58m ASD, which is 4cm above the level recorded in November 2012. The Kennington road has again been flooded where it passes under the A423, and Tollgate Road, Culham (Culham Bridge) is also closed, just some of the many road closures across the County. 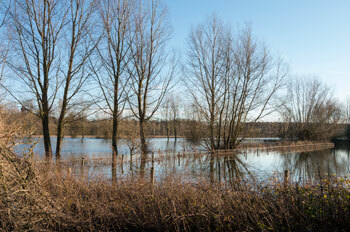 In Radley, the River Thames burst its banks floods causing extensive flooding across the meadows between Sandford and Abingdon and the effects were largely similar to previous recent events in 2003, 2007 and 2012. 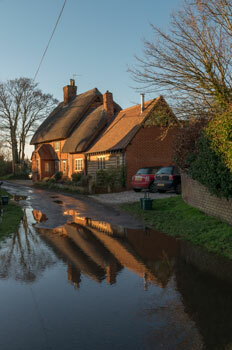 The following pictures were taken in Lower Radley on Saturday 11th January, as the floods were subsiding, showing that what can be troublesome for some can still have a beauty of its own. 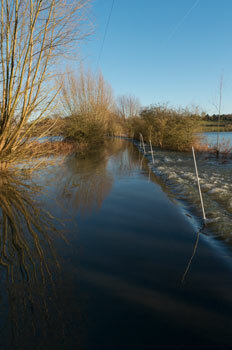 The causeway however remains passable to vehicles. The scene to the south of the causeway. and pets allowed to venture into it. 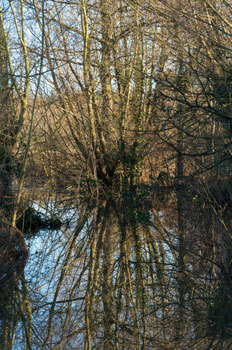 reflected in floodwater in the road outside. 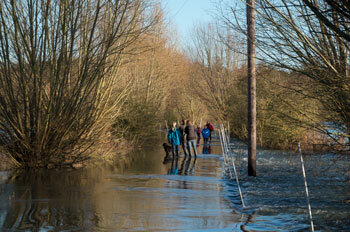 once leading to the river, now part of it. 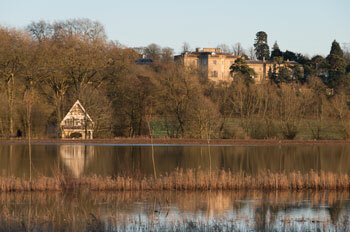 The little boathouse on the Nuneham Courtenay bank. 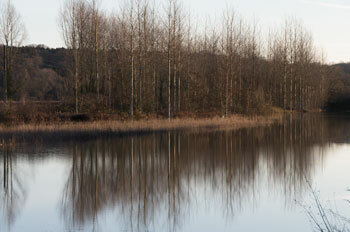 A copse of young trees reflected in the floodwater. with only water in between. 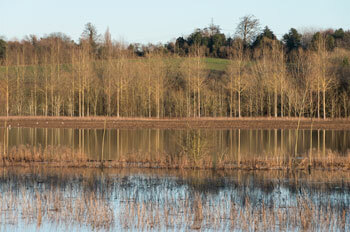 A line of trees reflected in flooded meadows. In 2003, such floods were described as 1-in-100 year events, in which case, the odds of 4 such events in 11 years would be estimated as being around 1 in 100,000, so very improbable. However climate variability can significantly affect these odds to the extent that more flooding can be expected on similar timescales in the future. The Botley and Kennington Roads have now been cleared. The Abingdon Road has now been cleared. 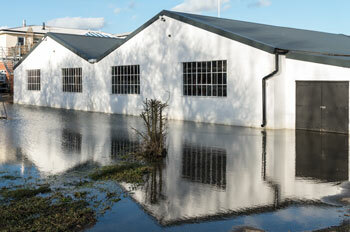 Further rain and storms continued to hit Southern England up to the middle of February causing river levels to peak once again during the week beginning 10th, bringing unprecedented flooding to many towns and villages lower down the Thames. 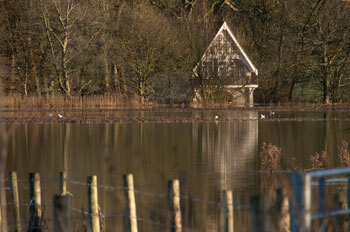 In Radley no homes were believed to have been flooded from the river, though some were affected by groundwater flooding. 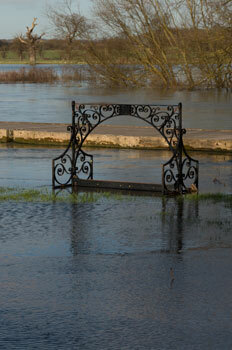 In Oxford, things were less bad due to active flood prevention measures having been put in place. 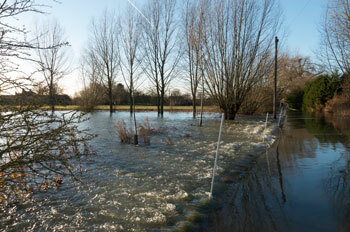 The Botley road remained open, and the Abingdon Road was closed only briefly. 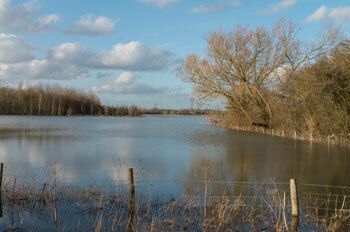 After the intense storm of the 14th/15th February, which brought some of the strongest sustained winds of the winter (so far) the weather has now calmed down and the floods are rapidly abating. 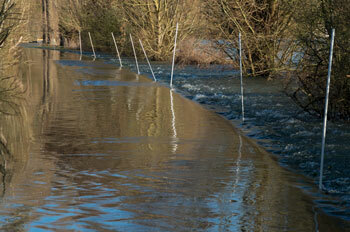 The following pictures show the scene in Lower Radley around the Radley College boathouse on 16th February, when levels were about 0.5m lower than 11th January. 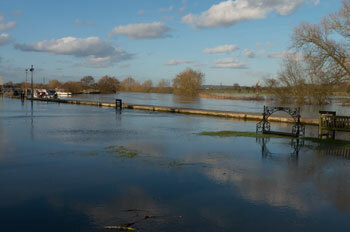 The River Thames at Radley Boathouse. The line across the picture is the floating wharf. 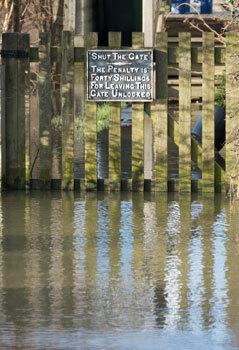 Wipe your boots here before embarking into the river!